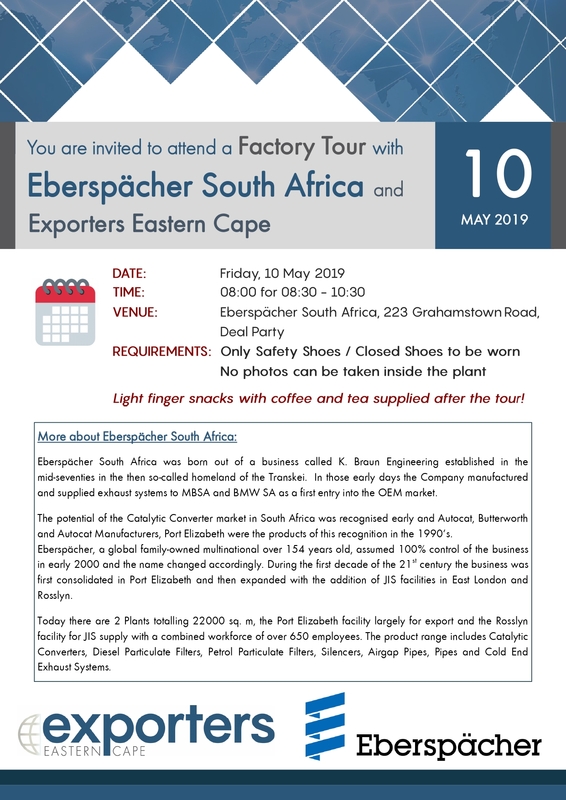 Join Exporters Eastern Cape for a factory tour of Eberspächer South Africa. Eberspächer South Africa was born out of a business called K. Braun Engineering established in the mid-seventies in the then so-called homeland of the Transkei. In those early days the Company manufactured and supplied exhaust systems to MBSA and BMW SA as a first entry into the OEM market. Eberspächer, a global family-owned multinational over 154 years old, assumed 100% control of the business in early 2000 and the name changed accordingly. During the first decade of the 21st century the business was first consolidated in Port Elizabeth and then expanded with the addition of JIS facilities in East London and Rosslyn. Today there are 2 Plants totalling 22000 sq. m, the Port Elizabeth facility largely for export and the Rosslyn facility for JIS supply with a combined workforce of over 650 employees. The product range includes Catalytic Converters, Diesel Particulate Filters, Petrol Particulate Filters, Silencers, Airgap Pipes, Pipes and Cold End Exhaust Systems. REQUIREMENTS: Only Safety Shoes / Closed Shoes to be worn. No photos can be taken inside the plant. Light finger snacks with coffee and tea supplied after the tour!